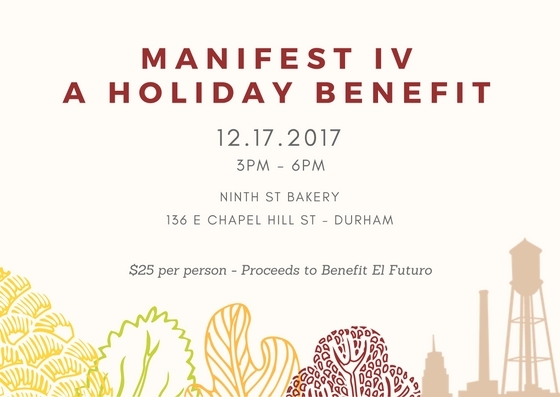 Manifest, the popular new pop-up dinner in Durham, is holding its fourth event on December 17th from 3-6 pm at Ninth Street Bakery. We have 50 spaces available for this event. Unlike previous versions, this one will directly benefit local Latino mental health non-profit El Futuro. Also unlike previous iterations, we will be taking a holiday party drop-in approach. We will have fireplaces going, and you are welcome to come to the cocktail hour (3-4 pm), food service (4-5 pm), dessert and performance (5-6 pm), or all three. The cocktail hour will feature complimentary Manifest limited edition IPA, wine for sale by the glass, as well as BYOB. Manifest focuses on real foods prepared with ingredients from local farmers and ends with a live performance. Check out our Ten Commandments of Manifest below. 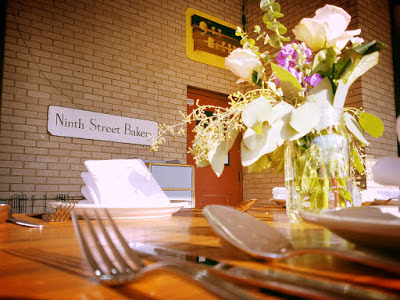 Dinner is served in a shared setting and offered at a reasonable price for value. Manifest is at once old-fashioned and novel, marrying the old tradition of the country inn table to the modern culinary world, setting the way we eat now within the ways we ate then. Manifest’s menus, different for each dinner, are full of variety, guided first by the knowledge that food can and should be both healthy and tasty. We are committed to deriving flavor less from cholesterol and salt, and more from freshness of food and its combination. We take chances and explore ingredients. We challenge convention and also abide by it, omnivorous in our cuisine and our interests. Manifest is about more than the cuisine. The central experience of eating should be part of the larger one of dining: getting to know the people we’re sitting with, widening our frame of perception, taking in more than the food. RSVP is on a first-come first-served basis via email to this address and pre-payment is encouraged via our online store. The suggested donation is $25. All net proceeds will go directly to El Futuro. Amazing work guys. Its amazing to see a bakery holding something for a cause. I'll make some money through best cv writing and donate it. Hope you guys reach your desired goal.